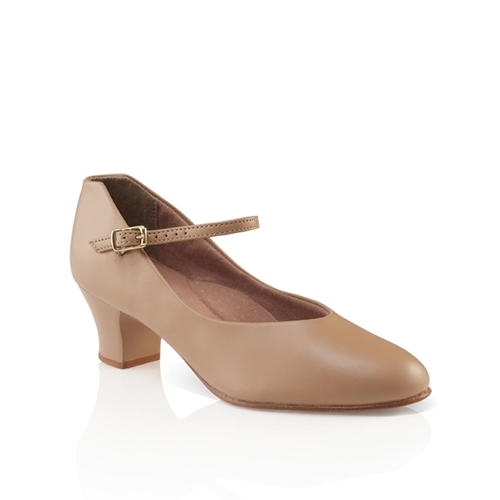 The Capezio Musical Comedy Shoe is the female shoe of choice for the entire entertainment industry. It is used constantly and everywhere from the Broadway stage to Las Vegas to choral groups and tap groups. It is the perfect shoe for choruses as well as leads in most musicals. It is the ideal character shoe and is also used for tap. Its neutral styling and shape make it perfect for a host of periods, settings and looks. An economical jazz or tap shoe, the Jr. Footlight™ is adaptable to most Capezio taps. Man-made upper with scored leather sole. 1 1/2" plastic heel with leather lift. Stitched buckle strap closure. Trim lines, tapered toe. For stage, tap, polka, and high kick routines. Strong heel attachment. Available in sizes 4 - 11 in medium (standard) width, 4-10 in narrow width, and 5-11 in wide width.